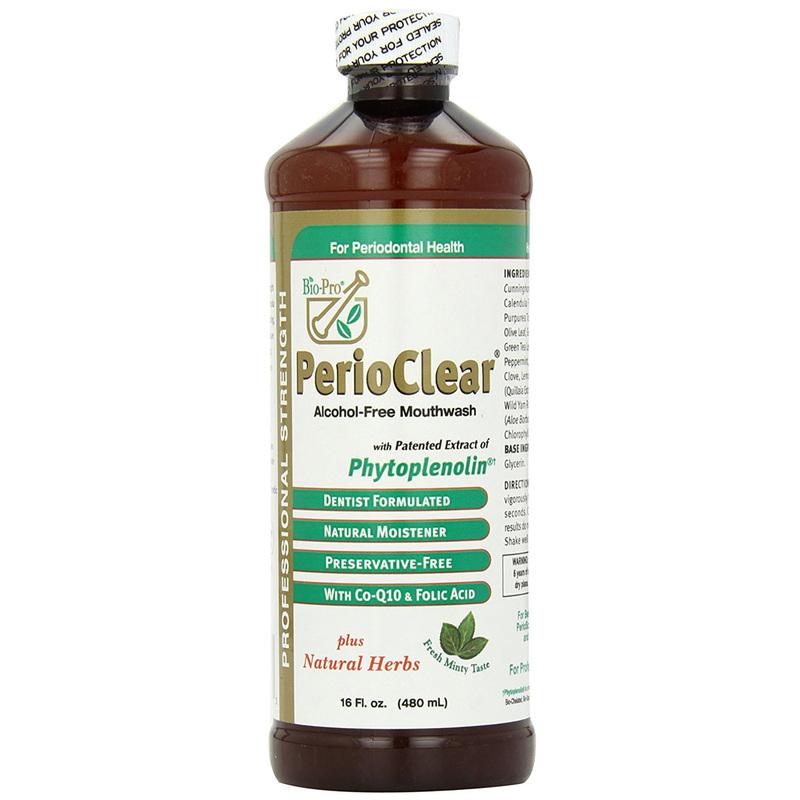 PerioClear is a powerful alcohol-free oral rinse and mouthwash that moistens tissue, freshens breath for hours and encourages periodontal health. This advanced mouthwash contains organic and responsibly wildcrafted herbs including Echinacea, Green Tea and Olive Leaf, ingredients well-known for promoting healthy gums. Essential oils such as Peppermint, Clove, Oregano and Thyme couple with Co-Q10, Folic Acid and the patented extract of Phytoplenolin deliver exceptional long-lasting results. Powerful oral rinse that moistens tissue, freshens breath for hours and encourages periodontal health. Ingredients: Phytoplenolin® (Centipeda Cunninghamii Extract), Bio-Chelated® Extracts: Calendula Flower, Chamomile Flower, Echinacea Purpurea Tops, Gotu Kola Herb, Prickly Ash Bark, Olive Leaf, Grapefruit Seed, Black Walnut Greens Hulls, Green Tea Leaf, Goldenseal Rhizome, Essential Oils of Peppermind, Oregano, Rosemary, Lavender, Cinnamon, Clove, Lemon, Eucalyptus and Tyme. Bio-Saponin™ (Quillaia Extract, Yucca Extract, Sarsparilla Root Extract, Wild Yam Root Extrat), Xylitol, Folic Acid, Aloe Vera (Aloe Barbadensis), Coenzyme Q10 (Ubiquinoe), Chlorophyll. Base: Purified Water, vegetable Glycerin. Directions: After brushing, rinse and swish vigorously twice a day with 2 capfuls for 30-60 seconds. Can also be used as a gargle. For best results do not eat or drink for 10 minutes after rinsing. Shake well before use. Visit your dentist regularly.